The Tampa Bay Rays will follow their disappointing series loss against the Los Angeles Angels with a pivotal 10-game road trip. First stop: Oakland on Monday for a three-game excursion that could help decide whether or not they remain in the American League wild-card race. The Rays start Monday five games behind Toronto for the American League’s second wild card spot. Oakland holds a one-game lead over the Los Angeles Angels in the AL West.The Athletics opened a 10-game homestand by losing two of three to Kansas City and have dropped four of their last six overall. Outfielder Josh Reddick hit two homers in Sunday’s 4-2 loss while finishing 6-for-10 in the series against the Royals. Oakland is hoping he can pick up the pace to help make up for the loss of Yoenis Cespedes, who was recently dealt to the Boston Red Sox. Tampa Bay first baseman James Loney is 6-for-9 over the last two games and has reached base in 22 consecutive contests. Oakland won two of three at Tampa Bay from May 20-22. Rays and Athletics series starters (over the last 30 days). 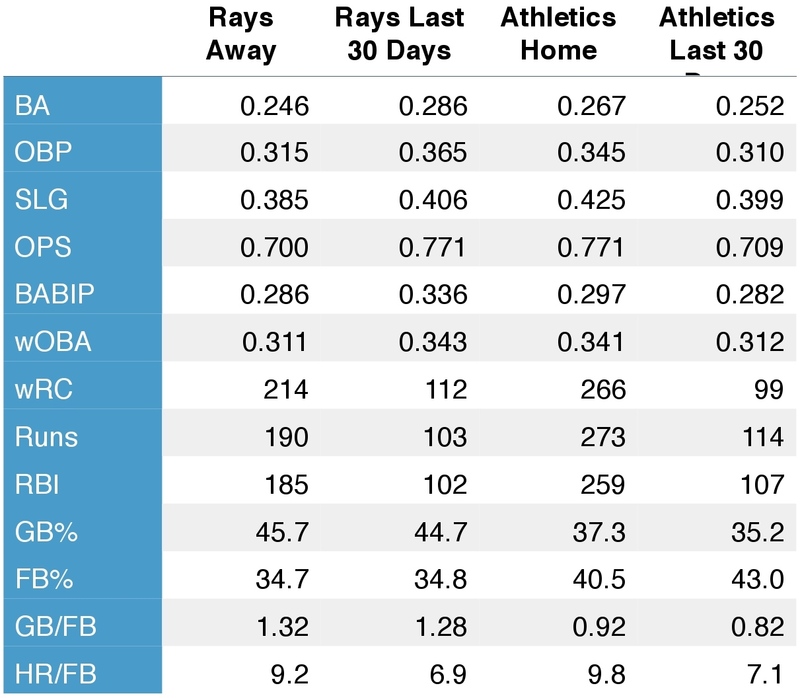 Rays and Athletics offensive production (at home, away, and over the last 30 days). 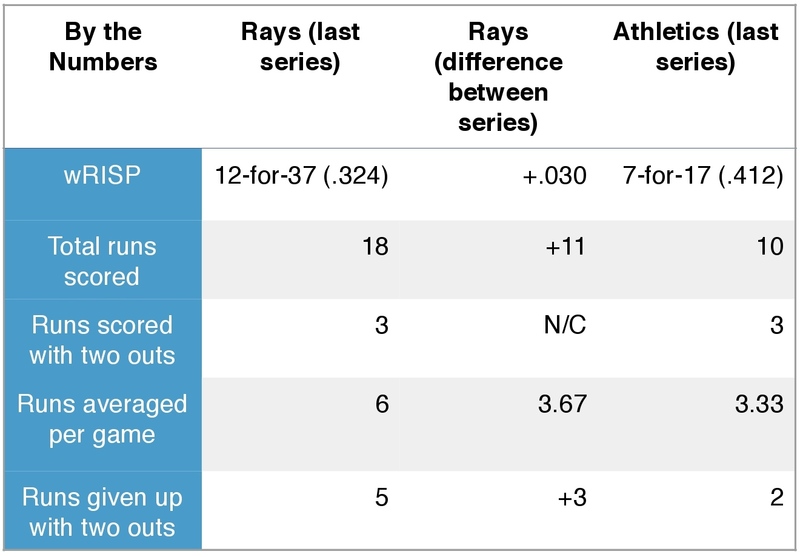 Rays and Athletics (by the numbers). Jeff Samardzija: Samardzija (4-8, 2.92 ERA) is 2-1 with a 3.19 ERA and 0.82 WHIP in five starts since joining the Athletics’ pitching rotation. He has allowed four runs in two of the past three starts, including in a no-decision against Houston in his last turn when he struck out seven in 6-2/3 innings. Samardzija has served up five homers with the Athletics after allowing only seven in 17 starts with the Cubs. Overall, Samardzija’s strikeouts of righties are down over previous seasons, but he’s also trimmed his walks to almost nothing and has coaxed more grounders. He’s made an effort to work down in the zone, trying to get grounders and avoid the homers that have troubled him in the past. At the moment, there’s even split of strikeouts between lefties and righties. 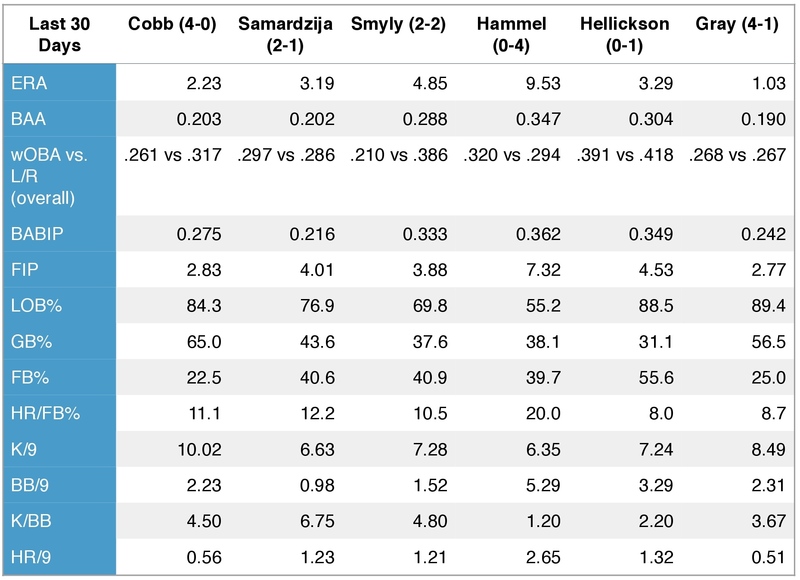 Left handed hitters — at the beginning of the season — hit more grounders and slugged .319. However, those numbers have flipped with the progression of the season, with righties hitting more grounders and with less power. Key Matchups: Yunel Escobar (1-2, 2B, 3 RBI), James Loney (1-3, 2B, RBI). Jason Hammel: Former Ray Jason Hammel (8-9, 3.87) has had a rough go of things of late. The Athletics have taken a loss in his last four starts, while Hammel has been pounded to the tune of 18 runs on 26 hits including five homers. The two pitch pitcher has been victimized when behind in the count (.298 BA/.385 OBP/.537 SLG with a 1-0 count, increasing to .469 BA/.605 OBP/.935 SLG with a 3-1 count) and with runners in scoring position (.282 BA/.358 OBP/.457 SLG, – 13.4 LOB%). The Rays will look to work good, patient at-bats against Hammel. Key matchups: James Loney (12-38, 3 2B, 3 HR, 9 RBI), Jose Molina (4-13, 2 2B, BB), Ben Zobrist (6-12, 2 2B, HR, 3 RBI, BB). Sonny Gray: Sonny Gray (12-4, 2.59 ERA) has been flat out great this year — his record and numbers (above) speak to that. Hell, he’s even been great in games where the A’s have lost. Let me put it this way all but two of his 22 starts have been sub-quality starts. It’s safe to assume Wednesday’s game will not be a walk in the park, especially when you consider that only four Rays have put up good numbers against Gray in his previous two starts against Tampa Bay. Key matchups: Cole Figueroa (1-3), Matt Joyce (2-6, BB), James Loney (2-5, BB), Jose Molina (1-3). Alex Cobb (7-6, 3.54 ERA) is 5-0 over his last six starts and his last two efforts have been excellent. He struck out 10 while tossing seven shutout innings at St. Louis on July 23 and followed that outing by striking out 12 and holding Milwaukee to one run and three hits in eight innings on July 29. Cobb is 3-2 with a 2.34 ERA in six career starts against Oakland, including a no-decision on May 22 when he scattered three hits over 6-2/3 scoreless innings. 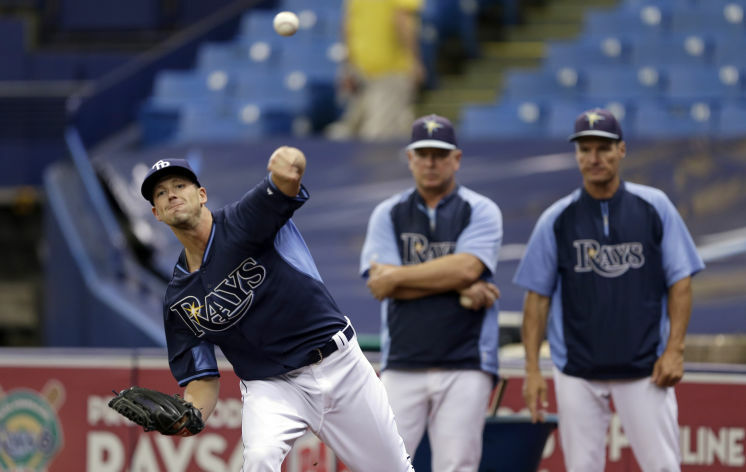 Drew Smyly will make his pitching debut with the Rays Tuesday. You can read about his stuff here. Logan Forsythe is 7-15 with a homer and three RBIs over his last five outings. Athletics OF/1B Brandon Moss is just 2-23 over his past six games. The Athletics lead 91-56 overall, 21-50 in Oakland.